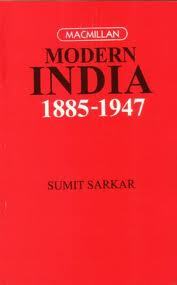 Nearly three decades (Published 1983) after its first publications, Sumit Sarkar’s Modern India remains the best summary of the most tumultuous period of Indian History (1885-1947). Formal students of History have spent countless hours guided by this masterful survey of Indian nation and nationalism; non-History students preparing for Civil Service or other exams, on the other hand, grumbled about this “difficult” book. But both the parties did not have any other option. Well, there are options – and one of the most recent of them, Sekhar Bandopadhyay is quite good – but then, if you want to understand the complexities of Modern India (today it seems more like Emergence of Modern India) Sumit Sarkar is irreplaceable. Sumit Sarkar was born in an illustrious Brahmo family of Calcutta in 1939. His father Susobhan Sarkar was a legendary Professor of History at Presidency College. Prof Sarkar was also one of the leading lights of Santiniketan under Rabindranath and played an important part in spread of communist thoughts. Sumit’s maternal uncle was P C Mahalanobis. Sumit Sarkar’s sister Sipra has been a renowned Professor of History at Jadavpur University. He studied at St Xavier School, Presidency College and Calcutta University. His doctoral thesis on Swadeshi Bengal was his first major research work. He taught at Calcutta and Burdwan University before moving to Delhi University in 1976. His wife Tanika (daughter of another famous Presidency Professor Amal Bhattacharya of English Department and Sanskrit scholar Sukumari Bhattacharya) is also a well known historian – in fact Modern India is dedicated to Tanika. Marxist thoughts had a deep impact on Sumit Sarkar and he was one of the founders of subaltern studies, who later mourned the decline of subaltern in subaltern studies. He has written extensively on politics, society and historiography of modern India. But his most famous work has been Modern India. I have spent many a lazy afternoon and warm midnight with Modern India. I am – like million others – sort of addicted to it. Once in a while, I like to open the book and read about a particular movement or a particular incident – almost every time I realize the value of a particular information or analysis all over again. I do not think it is an easy book for any student. He writes very long sentences with hyphen, comma and semicolon holding multiple pieces of information together. His analysis presupposes a certain degree of familiarity with historiography of modern India and at times with British or World History. Yet the more you read more you get drawn into it. Long after your examinations are over and you try to teach or talk or write about any particular phase, you realize you are unknowingly following Sumit Sarkar’s scheme of presentation. I suppose that is what happens with most of the college and university teachers across the country. From the point of view of a professional historian there may be a number of problems with the book. Today, in certain aspects, it has become dated as well. Perhaps the most important of all, the inelastic boundary of Modern India – 1885-1947 – today appears unacceptable. I have always wondered why Sumit Sarkar never thought of writing a second volume of his Magnum Opus. But today my growing unease about “Modern India” is not so much on account of its time period but for its near complete focus on the Political part of Modern India. Agreed, that Sumit Sarkar made a significant departure from personality-centred history of high politics, yet, the main focus is on how political consciousness spread to different geographies and social layers, ultimately culminating in partition and independence. Once upon a time, economic history of India was a craze among the brightest of research scholars. Unfortunately not only it has lost its glamour for researchers, graduation student is also still stuck at old notions of one dimensional Drain of Wealth or how commercialization of agriculture impoverished Indian peasantry. Recent researches (of last three decades at least) into regional variation of agrarian economy, small-scale industry and entrepreneurship have gone totally unnoticed. As a result, the obvious linkages between economic development and political movement – particularly at regional level – are not visible. A good point to start here could be Tirthankar Roy’s Economic History of India. In last two decades or so, Social and Cultural history has, on the other hand, generated a tremendous interest among scholars, journalists and performers. Some of the greatest themes of Indian history during this time period – emancipation of women, emergence of middle class, caste mobility, mass entertainment - definitely fall into the realm of socio-cultural history. I have seen interesting books/ write-ups on various aspects of socio-cultural history but cannot think of a single volume survey or general introduction. The volume edited by Prof Dilip Menon may be taken as an interesting introduction to socio-cultural stirrings of this period but it is not comprehensive in its scope. How long is it going to take for a new Modern India to be written with equal emphasis on political, economic and socio-cultural developments? That cannot totally replace Sumit Sarkar but will definitely produce a more comprehensive picture of how modern India took shape and will be far more interesting to general students. Again teachers in India stubbornly refuse to make History teaching a more multidimensional experience. Why can’t we prescribe a few novels and autobiographies as part of our modern India syllabus? Movies and digital photo archives can provide another wonderful medium to connect History with today’s generation. I like to read whatever I can lay my hands on - novels, autobiographies or watch movies or exhibitions – but finally it is Modern India, which helps me to link my new piece of information with the grand narrative. These days often I feel social mobility or cultural movements are inadequately covered but still the voice of gentle Professor remains my best guide. It never occurred to me that I have not been his direct student.